Bacteria that are resistant to antibiotics are one of the biggest problems facing public health today. About 800,000 children worldwide die before their fifth birthday from diarrheal diseases that evade treatment. The concentration of those diseases is highest in parts of Africa and Asia. To address the problem, biochemistry professor Srivatsan (“Vatsan”) Raman hopes to harness the power of phages — viruses that infect bacteria but leave humans unscathed. 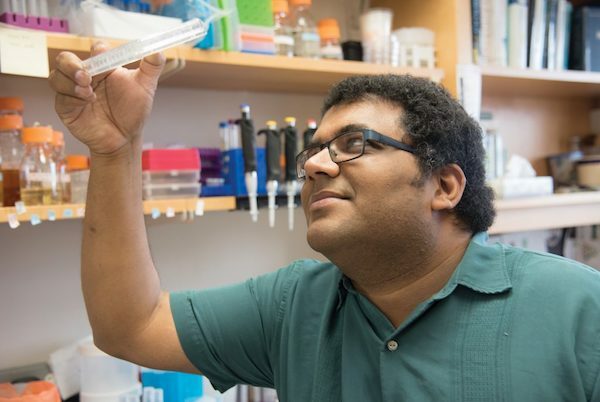 With help from a grant from the Bill and Melinda Gates Foundation, Raman’s team is designing phages to specifically target bacteria that are causing diseases in infants. Raman describes antibiotics — how doctors usually fight infections — as hammers that take out many bacteria, both harmful and beneficial. This means they can affect the entire human microbiome, which is the community of microbes on, inside and around the human body. “We do not yet have the tools to selectively edit the composition of a microbiome,” Raman explains. But that is one of the goals of his lab’s work with phages. Unlike antibiotics, phages are very specific. A phage only infects one type of bacterial host. It is this specificity that presents Raman and his researchers with opportunities — but also some challenges. Phages, which resemble lunar landers, locate bacterial hosts by attaching to specific receptors on the cell’s surface. Once they have found their host, some phages, called obligate lytic phages, quickly infect the cell and replicate. Once replication is complete, the new phage progeny burst out of the cell, ready to infect and kill the next available host. Raman’s goal is to be able to control many steps in this process. He is investigating a way to engineer a phage that can be programmed to target specific bacteria. By changing just the “legs” of the lunar lander, the designer phage can target and eliminate any bacteria the researchers wish. Raman’s laboratory working on this project. However, while destruction of bacteria is the ultimate goal, the process also creates problems. Many bacteria contain toxins that are released if the bacteria die in large numbers. So Raman’s team is also trying to control the rate at which phages infect and kill cells inside the body. “We can keep the phage on a leash and determine when and where it can infect,” describes Kelly Schwartz, a postdoctoral fellow in Raman’s laboratory. Raman believes “designer phages” have great promise for human health. “I was drawn to this research because designer phages can provide a potential solution to the antibiotic resistance problem,” notes Raman. “These bacteria are resistant to anything you throw at them and are killers in developing countries. “And the next question, if we are successful, is ‘How can we turn these phages into actual medications that can be delivered to these areas?’ That challenge awaits us further down the road,” Raman says. This story originally appeared in Grow magazine and can be found here.